Submitted for the categories Forget Me Not, and Show Us Your Arms, this entry marks Mistress katherine's fifth entry into the Challenge, and makes her the first person to meet the Pentathlon requirement, and complete the Challenge! She will receive a prize for doing so. 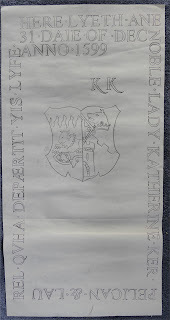 This rather macabre project involved producing a tracing of katherine kerr's tombstone, which is very similar to that of her cousin Ionet Ker (Lady Restalrig). According to the 1927 drawing made by S.T. Calder in Restalrig Church, Janet Kerr died on the 12 Day of Maii Anno 1596. 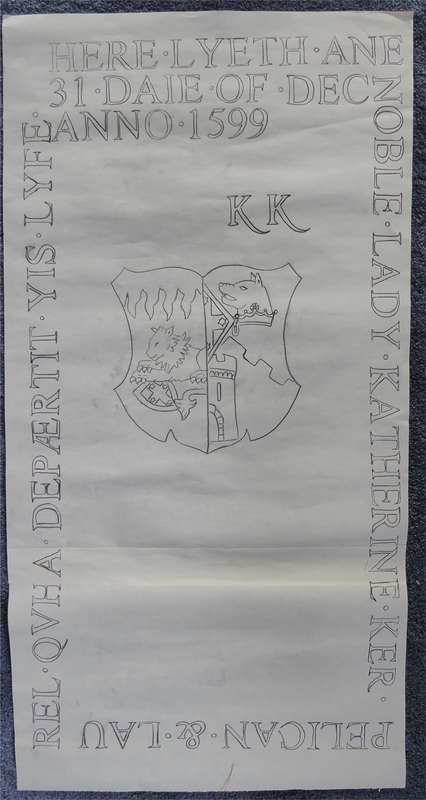 Katherine's tombstone follows the same pattern, but notes that she died on the 31 Daie of Dec 1599 (the last day of the SCA period); cites her as being a Pelican & Laurel; and includes her arms (with the hopefully soon-to-be-passed augmentation) marshalled with those of her husband Master Bartholomew Baskin. You can find Ionet Ker's tombstone here.